Julian was instructed on a direct access basis, acting pro bono, via the Children’s Society who work with Drystone Chambers to seek help for their clients. 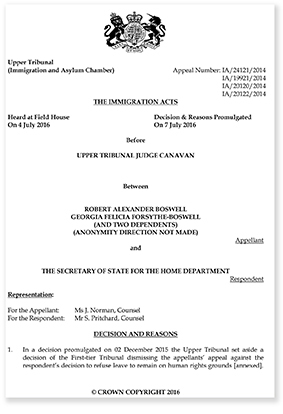 The case concerned a family of four who had overstayed in rather unusual circumstances: the father had been a soldier in the British Army, but had not served for the requisite five years which would have enabled them to settle in the UK. He had served in Iraq and was suffering with Post Traumatic Stress Disorder. Having left the Army, he no longer had leave to remain, and the mother was expecting the second child. The family remained in the UK and sought leave to remain on human rights grounds. Unfortunately their appeal was initially dismissed, they sought leave to appeal, and Julian was instructed for the rehearing. She argued that notwithstanding that the father had not achieved five years’ service, and that his discharge had been dishonourable, nevertheless the weight to be attached to the public interest in removing over stayers was tempered by the application of the Armed Forces Covenant, which recognises the particular debt of society to those who have served and their families. The two children had been in the UK for over seven years and it would not be reasonable to expect them to leave, particularly since one was now entitled to leave in their own right. Applying s.117B NIAA 2002 the family should be entitled to stay on human rights grounds.